Individuals with severe overweight have an inhibited sense of satiation – they release fewer satiety hormones than people of normal weight. The reason: the responsible cells in the gastrointestinal tract of obese people are severely reduced. This report Swiss doctors in the journal Scientific Reports. Surgical weight-loss procedures can repair this disorder. The mucous membrane of the upper gastrointestinal tract is home to highly specified cells, the so-called enteroendocrine cells, that constantly analyze our intestinal contents. During a meal, they release satiety hormones into the bloodstream. This signalizes to the body that enough food has been taken in and that the meal can be ended. The sense of satiation is created in the central nervous system. Compared to lean people, the release of satiety hormones is reduced in obese people. After bariatric surgeries, such as a gastric bypass or sleeve gastrectomy the release of these hormones increases again. Researchers from the Department of Biomedicine at the University and University Hospital Basel and the St. Claraspital Basel together with colleagues from the University of Liverpool have studied the reasons for this reduced release of satiety hormones. They examined tissue samples of the gastrointestinal tract in 24 lean volunteers and 30 obese patients before and after weight-loss surgery. The team of researchers led by Dr. Bettina Wölnerhanssen was able to show that the number of enteroendocrine cells in obese people is significantly lower than in people with normal weight. This leads to a reduced release of satiety hormone which in turn leads to altered appetite. The obese also showed alterations in the pattern of the so-called transcription factors which are responsible for the development of enteroendocrine cells from stem cells. After surgery, the number of enteroendocrine cells and the pattern of transcription factors were almost entirely restored. "Unfortunately, obese people are often stigmatized, and it is a common belief that the reason for obesity lies in a lack of self-control and discipline," comments Wölnerhanssern the study's results. However, there is no doubt that metabolic factors are playing an important part. The study shows that there are structural differences between lean and obese people, which can explain lack of satiation in the obese. 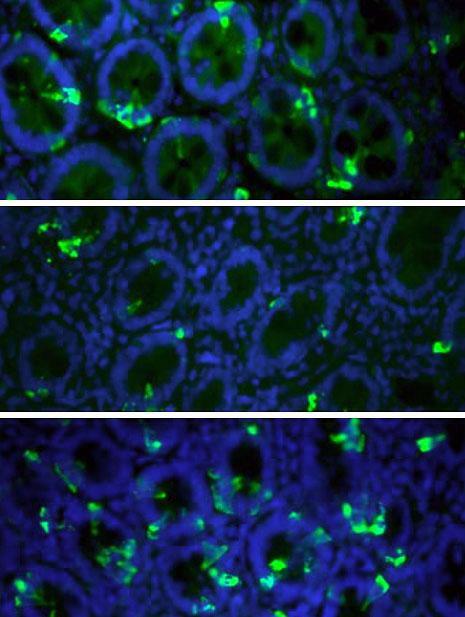 Deregulation of transcription factors controlling intestinal epithelial cell differentiation; a predisposing factor for reduced enteroendocrine cell number in morbidly obese individuals.